76021 The Milano Spaceship Rescue is a Marvel Super Heroes set released in 2014. It is based on the film, Guardians of the Galaxy. The Milano vaguely resembles a bird. It is mainly comprised of blue, yellow and grey parts. It is being piloted by Gamora and has room for Drax, Star-Lord or any other minifigure to fit inside as well. The exterior has various decorations, most of which are on the wings. The lower part of the "head" has features gun pieces that fire 1x1 round plates in transparent orange. The enemy ship is mainly dark red, black and grey. It has two small flick-fire canons on both sides that shoot transparent red projectiles. The cockpit has a red decoration on it. The inside can only fit the pilot, so Ronan has an area to stand on outside. It is possible that he can also stand on the back. This is a description taken from LEGO.com. Please do not modify it. 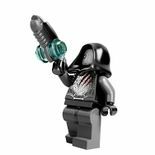 (visit this item's product page) Join the Guardians of the Galaxy™ for the ultimate battle against evil Ronan! 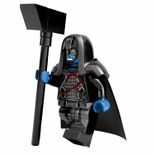 Prepare for an epic clash between the Guardians of the Galaxy™ and the ultimate villain, Ronan™! Ronan zooms into this epic deep-space battle in his personal Necrocraft™, backed up by the Sakaaran™, and holding his all-powerful Cosmi-Rod™ ready to strike. Luckily, Star-Lord™ is prepared to launch a counter-attack with the equally potent Hadron Enforcer™ and 2 iconic space blasters. Steer the mighty Milano Spaceship™ into battle with Gamora™ and Drax™, firing the stud shooters and flick missiles to repel this evil threat to the Galaxy. 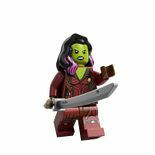 Includes 5 minifigures with assorted weapons and accessories: Star-Lord, Gamora, Drax, Ronan and the Sakaaran. 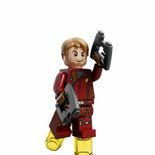 Star-Lord in his exclusive Ravagers suit is equipped with boot thrusters, 2 iconic space blasters and a large Hadron Enforcer space blaster. This set was designed by Marcos Bessa. Facts about "76021 The Milano Spaceship Rescue"
This page was last edited on 9 January 2016, at 21:33.